However the airport is operating normally, despite their presence. 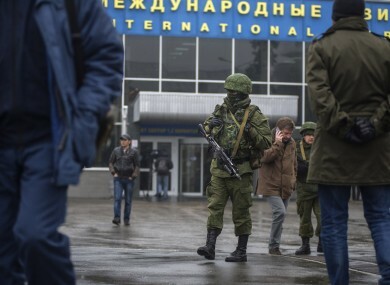 THE AIRPORT IN Crimea’s capital Simferopol is operating normally this morning despite armed men in military clothes who have begun patrolling outside it. Passengers had normal access to the airport, on Ukraine’s Black Sea coast, and were checking in for flights. An earlier report said that it had been seized overnight by armed assailants. However a dozen unidentified armed men could be seen outside the airport perimeter. They did not respond to questions about where they were from. The airport’s information service said that the airport was “working as normal”. Interfax-Ukraine news agency had earlier reported that around 50 unknown gunmen carrying Russian flags had seized the airport building in the early hours of this morning, a day after pro-Russian armed men took control of the city’s regional government and parliament buildings. Another dozen unarmed pro-Russian men were standing outside the entrance to the airport territory and told a reporter that they were there to keep order. “We are against fascism and nationalism. We are remaining outside the airport,” said Dmitry, a young lawyer, without giving his surname. On Thursday Crimea’s regional parliament, which remained under the control of pro-Moscow gunmen, voted to hold a referendum on May 25 to expand the region’s autonomy from Kiev and replaced the local government with a pro-Russian official. The raid followed the ouster of Kremlin-allied Ukraine president Viktor Yanukovych last weekend in an avalanche of change following the deaths of scores of people in clashes in Kiev. Email “Armed men are patrolling one of Ukraine's main airports”. Feedback on “Armed men are patrolling one of Ukraine's main airports”.